24 Dec The Empty Shelf Challenge! This is a photo of one of my bookshelves in my home office. Why is it empty? Because I plan to fill it this year. Empty a shelf in your house somewhere. Every book you read from now until December 31, 2014 goes on the shelf. (Waiting until January 1st to do something awesome is stupid and fake.) At the end of the year, I guarantee you will have read more than you did in 2013. Best of all, you’re scientifically more likely to accomplish something when you have people working on it with you. If you’re a digital reader, take a screenshot of the cover and share that. Or if you’re a library person, take a shot of it on your shelf and then return. Any and all books count, not just non-fiction. You ready? The hashtag will be #EmptyShelf. It’s time for the empty shelf challenge! Great idea! My Pinterest username is sarahradams. I just followed you. If you follow me back, I can add you to the board. Follow me back at http://www.pinterest.com/sue_anne/, and I can get you added to the board. Do you mind adding me? http://www.pinterest.com/lessonsfromivy I just followed you. I just followed you sue…can you add me to the board? Just followed you with username KyleMacon. Can you add me to the board? Sue Anne, I just followed you on Pinterest – will you please add me to the board? Thanks! Are you the official adder? My pinterest name is Housewife Mama. Thanks! Ellis1002. Can you add me? I would like to join. My Pinterest name is Jennifer Bast and I’m following Sue Ann. Can you add me on Pinterest too? My Pinterest name is veronicamarecle. Thanks!! My Pinterest name is ellis1002. Can I please be added to the board? slroberts70 on pinterest, thank you! Add me, please! onegapeach on pinterest. Thanks!! Hi can you or someone pretty please add me to the board? caitlinsmom07. My name is Michele Ramirez Michael. Thanks! Great idea. Please add me. Pinterest username is baggas. My pinterest name is tinkerbell9902. Looking forward to this challenge. Great fun. Here is a link to my pinterest. Really like this idea. Should I tape of strips of paper for the eBooks I read on my Kindle? Hey, for all those that read Kindle books, ebooks, or get books or audio books from the library, etc. I created a template that you can print out. You just cut it out and fold it into a ‘book’ to put on the shelf. I like the feeling of doing something physically to mark accomplishments. Plus I like creating. Quick ? What if you read a lot of e-books? Can we do the empty shelf on our e-readers too? I use GoodReads to keep track of all the books I read and you can set up custom bookshelves. I made a new one called emptyshelf and I’ll just add ebooks that I read to it. I can take a screenshot as it fills up. That sounds good to me. I don’t keep every book I read–anything I won’t ever read again (and isn’t a reference book) gets listed at Paperbackswap.com to go to someone else to read. Love it!! My pinterest name is Melissa Kile. Thanks! What’s your pinterest name? I need to follow you & you need to follow me back so that I can add you to the board. In! This sounds like a challenge I can tackle with great glee, unlike those “go to the gym,” “floss every day” kind. I’ve followed you on Pinterest. If you follow me back, I can add you to the board. Can you add me? My Pinterest name is dilemmamike. Sue Anne, could you add me also, please? I just followed you on Pinterest. My screen name there is jasonirl. Thanks so much! Awesome. My Pinterest is sarastacy. What happens if you don’t have shelves to empty because you’re already out of shelves? Such is the life of a bookworm. That was my thought! How on earth am I going to find an EMPTY shelf??!! Buy another shelf? Use the top of a shelf? I had to clear one off too; still not sure where everything I cleared off of it is going to go, but it’s a start! I’m going to box up all of my books from one shelf. When it’s the end of 2014, it’ll be like Christmas again! I made 2014 shelf with all the books I’m GOING to read . . . as well as some on my kindle. Can’t wait to get started. I did that LAST year … and .. uh … they’re all still there! ‘Cause I found OTHERS to read in their place …. NEVER enough time. I have a Kindle. Darn. How about empty page challenge? I just followed you on Pinterest. If you follow me back I can add you to the board. Can you please add me as well? My Pinterest username is karawilliamson. Thank you! I just followed you on Pinterest. If you follow me back, I can get you added to the board. I just followed you on Pinterest. If you follow me back, I can add you to the board. Also, I’d love to join the Pinterest fun. I’m Dan Cooper on there; if you search by my email you should find me. What’s your Pinterest name? You can follow me (I’m sue_anne) and then I can add you to the board. Ahh! Best idea ever- but what if I only go to the Nashville Public Library far more than I ever visit a Barnes & Noble?? Are the rest of your books organized by color? Because I noticed those bottom two shelves are! Love this idea! Please add me to the board, user name bethkaylor. What’s your pinterest user name? Could you follow me — I’m Sue_Anne. I can add you to the board after you follow me. Please add me to the Pinterest board. My Ponterest name is celialoewen. Thank you & Merry Christmas. If you follow me back, I can add you to the board. Thanks. I’m now following you. Please add me to the board. What a great idea! I LOVE to read, so this is right up my alley! Brilliant! I’m in. My pinterest is Oddlysaid. I guess that means I’m going to have to pin stuff, huh? Follow me back, and I can add you to the board. Done! Sorry, I just came back to this. Thanks! Loving that old copy of the Silmarillion chillin’ on the bottom. I’m in! What a great idea. My Pinterest name is cdigel1. Awesome idea–my pinterest name is alyssajoy64. Going to clear off my shelf when I get home! I’m in. Been keeping a list for years but never have taken pictures. Are audiobooks okay? This will challenge me to read more than just the books on my Kindle. Count me in! Athena Sparrow(athena612) on Pinterest! I just followed you (Sue_Anne). Perfect idea. Pinterest name is Schakett6. Game on! I love, love, love this idea!!! I plan on issuing this challenge to my students. Count me in! My Pinterest name is shonnaryals76. I use my Kindle for lots of my reading, but I’m going to clear a shelf and come up with a creative way for me to see the books I’ve read. Great challenge! Fun! I actually did this for 2012, and I love looking at my full shelf! My pinterest name is Rebecca Vance. What is your pinterest name? There are several Rebecca Vance’s on Pinterest. If you follow me (Sue_Anne), I can add you to the board. There are a lot of Rachel Bruce’s on Pinterest. Follow me at http://www.pinterest.com/sue_anne/, and I can get you added to the board. Awesome. I’m in @aterrible is my screen name. My first New Years Resolution!!! I love this idea. My pinterest name is Nizia Dantas. Thanks for share your great idea. I read anywhere from 1 to 4 or 5 books in a two week period (length of a library check out). I am quickly running out of books that my local library has that I am interested in and have had to resort to Interlibrary loans. Love this! My Pinterest name is adielg. EricSticht is my pintrest. I started reading 7 Men By Eric Metaxas last Night, first book on the Shelf. My pinterest name is Cindy Waller. So excited to do this! !!! Pinterest username: Captivated121 Thanks for coordinating this, Jon! Yes! Love this! I’m on Pinterest… I think my “handle” is brittsh but my name is Brittany Hussain! This is exactly what I need! My goal is one book per month! My Pinterest username is rkilosky. What an awesome idea! I created a virtual shelf on Goodreads to store my books. lol… I think we must be true to ourselves, eh? will enjoy this challenge! Challenge accepted. Anpriebe is my pinterest name. I do this every year…but with 2 book shelves!!! Yes! And I love that you aren’t waiting until 1/1! I’m new to Pinterest, but you can find me at GPSFinanceCoach! Ha! Great idea. This will motivate me to move books from my “waiting to be read” shelf/shelves to a new “read it!” shelf. Which also means I’ll be clearing out already full shelves…..that will need filled next year. win, win, win. Count me in! I love this idea. My Pinterest info is dustinmoody. And do I spy the first Wheel of Time Book on the shelf above? Looks like it is as worn as my copy! LOVE this kind of thing!! Great idea. Just cleaned off the shelf (in other words big pile of books on the floor now). my Pinterest username is angelfischwi. Love this! My Pinterest name is Bethany Perry (bperry95). I’m running0nfaith and this is an awesome idea! I love this idea! My pinterest user name is cfaitha. I’m in!! Love this idea! My pinterest name is jennmpeterson Thanks Jon. Love this! My Pinterest name is Karin Wizer . I have friends who buy the under bed storage containers for their books. They also use books as furniture (stacked up with glad on top for a table etc) because they both read so much. And that’s with using the library as well! Awesome!! My pinterest name is jenlea72. I don’t buy books anymore — or I very rarely do. And, when I do buy a book, it’s because the library didn’t have it, so once I’m done, I donate it to the library so they can have it in their collection and someone else can read it. I rarely want to read a book more than once and when I do, I can go find it. I do have some I’ve kept over the years. Don’t get me wrong, our house is FULL of books – I just don’t need to keep on collecting and I like to spread the joy. Love this! My Pinterest name is bjbcrichardsaz. why do you have two copies of Blue Like Jazz on the same shelf? Will there be an elf on said shelf? Love it! Clearing it now! Love this! I’m a Kindle reader, and each year I create a collection called ‘Read (Year). It will be fun to do this with a group. My Pinterest name is treesalyn. Oh this is AWESOME! Pinterest name is http://www.pinterest.com/lessonsfromivy. I’m almost done with a book too so I get a head start. Ironically enough I just finished SCL this morning (and I’m totally not just saying that I really did.) Unfortunately it was the Kindle version so no idea how to include that on the shelf. I am not much of a reader, nor am I on pinterest, Facebook, Twitter, or the like. However, I do like this idea and I just may have to join. I just won’t share my filling shelf socially. Um, do you order your books according to color of the spine? My pinterest name is StephanieRunk! This is my question… Audio books . I can screenshot the cover. Now, what is my Pinterest handle? Oh yeah, rfbryant. Baxterclan4 is my Pinterest name. I’m in. Love this idea! I’m Vikki Stringham on pinterest. Wonderful idea. My Pinterest name is sdmadd1. If you follow me, I can add you to the board. I’m in! Can’t wait! Pintrest name is peteherrick. Thanks for the inspiration Jon. Add me. Although most of my books will be text books as I start school. 🙂 Pinterest is larethahulse. Yes! Please add me….my pinterest name is Jodi Musgrove. Great idea! What a great idea! My Pinterest name is Juanita (I just joined — not sure how it works, you can probably find me by my email). Love it! Pinterest name bwehnes. I’m in! @sassyjomi is my handle on pinterest! @kjtanner on Pinterest. This is going to be superfun. I’m In. Great idea. I always set a book reading goal for the year. I like the idea of watching the empty shelf fill up rather than just checking a number on a list. Hey Jon. Love this idea. I already have a general reading board on Pinterst, but have now created a new bookshelf challenge board for 2014. I look forward to filling it up. Challenge accepted! My Pinterest name is tovahatha. I’m in. My pinterest ID is beckduer. Please add me! My pinterest user name is keelyptaylor. Thanks! Great idea! I’m in! My pinterest username is BabsKaye. I am interested in what they thought of the books they read, too. Can’t wait. Good reason to buy another bookshelf. Have books piles on my floors! Pinterest name R Magers; please add me! Do you put your books in order by color? Add me please! My Pinterest name is Genabean28. Yes! Add me! Love this challenge! I’m in. I did this alone in 2013 using a virtual shelf in the Good Reads app. My Pintrest name is rshannonsmith. And I love that your bookshelf is color coordinated! I’m in!!! My Pinterest is ourepicjourney. My pinterest is glad2do. I LOVE LOVE to read. Yes! Count me in! Pinterest name is jtapley . My hubby and I are going to do this! My pinterest name is Katie Arthur. I do this every year! You can find my bookshelf over on Goodreads. Karen Linton. I love this idea! I am on Pinterest: lorilwaters. I plan to do this with my fifth grade class! At the risk of being Captain Obvious is this to motivate us to read MORE or just to keep track of what we are reading. Because if I read more my husband might ship me off. LOl I do think this is a great idea! That would be fun, except I get most of my books from the library or borrowed from friends. Love this idea and is something I would do, but we are living in a small house, & will be moving (we think) within 6-7 months. My wife would kill me if I cleared off a shelf of books only to refill it with new ones. Pinterest name is JenniferGott. Love this! I’d love to join this challenge. My Pinterest name is Dawn Tomaschefsky. My pinterest name is Jennifer Webb(jennybek). I’m going to create a collection and (hopefully) keep track of my audible/kindle books. I’ll post pics of any IRL books, too. I like this idea! I’m in. Pinterest is theboysnme. One of my goals for 2014 is to read at least 12 books. Thank you for including us digital users! My Pinterest user name is jackielott70. I love this idea! Add me to the list. My Pinterest name is jasonvana. I reblogged your post. I LOVE THIS CHALLENGE! Are your other books organized by color????? I love this idea! I’m going to try it. My pinterest is Mandaleighna. Thanks! Great idea Jon! I’m WholeDonkey on Pinterest. Please add me to the pinterest board. My name is kadeesign. I’m in. My Pinterest name is: Books & Bobbins. My books vary from bought to borrowed. I love this! My Pinterest name is jones0807. Starting this ASAP! Here’s the question: What’s on your list waiting to be read? This could be feeding an addiction I already have. Nook, Kindle app on the I-phone, library card, and good old-fashioned books. And I just opened a gift card to McKay’s Book Store in Nashville! I’m in. My Pinterest name is Ray Hausler. I’m so excited about this challenge! Don’t know how to post a picture to your Pinterest though. Eveapple is my Pinterest account. I am a library girl, so my shelf will be different every time! Great idea! I’m not joining in since I read about 200 books a year so I’d need to get another whole shelf. And even if I could get another shelf I’m still faced with the problem of the fact that I like to have my books sorted on my shelves! So I’ll just say good luck to you all! It is also fun to count the pages also!! As I read I pass along to my sister, so I will use my shelf like a library one!! I’m in! Since we’re moving sometime this year, I’ll do digital and pics. My Pinterest name is AmandaSims. My Pinterest name is Shecca… I love this idea! I’ve already taken the picture of my empty shelf. I’m in, but I’m at the in-laws’ so clearing a shelf will have to wait till after Christmas. My pinterest name is c_sexton. Love this idea!! An avid bibliophile being challenged to read more…this will be fun. I just cleaned off a few shelves of books to either donate to the church library or give to friends…And, my husband got me a Kindle for Christmas so I can finally join the ranks of the e-reading people. Playing along digitally. =) Pinterest name is bethzimmerman Thanks! Fun! My pinterest is jennjwoodward. I’m definitely in! My Pinterest is stephywubba. What a wonderful idea! Goodreads has a similar challenge. I read 24 of the 30 books (80%) toward my goal. I’d like to join your challenge in 2014! Merry Christmas! Great idea! My Pinterest name is mleclerc79. Can’t wait to get started! Definitely taking this challenge! I already have about 30 books in my iPad, plus we have a library at work with plenty of great books. 2014 will be all about learning. Thanks for creating this #EmptyShelf challenge. My pinterest name is Kat_978. Oops, sorry…my pinterest name is katrinamp978 (not Kat_978). Oh- forgot my pinterest name is Carrie Gordon. I’m in! My Pinterest name is sassafras5281. I joined pinterest just for this! My pinterest name is rkengland04. Sweet! I was already starting to plan a similar challenge. My pinterest name is Kayla Bonar. Also, the fact that you have at least two copies of Blue Like Jazz as well, makes me believe we have some sort of kinship we just don’t know about. My pinterest name is mamakellic. This sounds super interesting! Count me in! I’ve even already cleared a shelf (somehow…) and taken a picture of it. I’m TheJCHoward on the Pintrests! Great idea; I’ll clear out a shelf. I’m in. Name is Charles Dairo. My Pinterest username is CharlesDairo. I am looking forward to this. On Pinterest I am tigerrama85 and my wife is beingvfox. I’m in! My Pinterest name is Rebecca Sorrells. Question – I have several books that I have started. Do I need to start them again to count them? We are in! Our Pinterest name is kenandjanie. Thanks! My Pinterest name is Megan Pulling! Add me to the #EmptyShelf board, please! My Pinterest is Keely08 GREAT IDEA! I’m looking forward to seeing what others are reading. Mine will probably mostly be text books – but let’s hope I find time for some relaxed reading. Merry Christmas! love it….won’t take long to fill it! I’m taking my challenge one step further and will post it on the board when I’m in. I’m so excited!!! This is what my blog/dream is all about – books! I can’t wait to see what others read! I commented on your pin to make it easier to add, but I’m under Jamie Lapeyrolerie. Visual insentive is a wonderful thing! Great idea! I’m already trying to read a hundred stories in a year (fifty short stories, and fifty full length books), so this is great. Sounds awesome! My Pinterest Username is avharten. I can’t wait to get started…think I’ll go start right now! Or it might be under Shereah…not sure which. My Pinterest name should be emmmmygrace 🙂 can’t wait. I might start a little early though. I’m in! I’m going to suggest my roommates join us too!. My Pinterest name is jeanneg4 … gotta go now and empty my bookshelf. 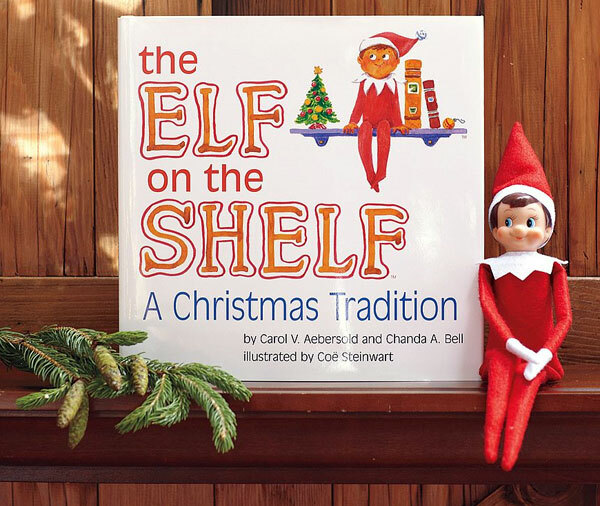 I’m in although a little disappointed because I thought the challenge was to get rid of the Elf on the Shelf for 2014. Darn. Reading is great too though. Oh – and I am therealheidib on Pinterest. I’m in! Pintrest name is Heather_Crawley. Have my digital empty shelf ready to go. Love this idea! I’d love to join in on the Pinterest fun, too. I’m “carolineugmh” on Pinterest. Awesome idea! My Pinterest name is jennysminute. I think this is a wonderful idea! I will have to motify it slightly and buy another book case for 2014, I read atleast a book every two days. My goal will be to fill my new book case. Love it! Switching offices after Christmas and I will leave an empty shelf! I love this and I’m excited to begin this challenge!! My Pinterest name is sunshinegirl88. What a great challenge! My Pinterest name is sholmes82. Hopefully I won’t forget. My Pinterest is keenkeyd. Awesome !!!! Pintrest name is ncoby01. I’m glad you’re including eReaders and library readers! My Pinterest name is Lizzy Larson (llizzylou42). This will be so good! We own many books that I have yet to read. I am excited for this challenge as I have some book that I own and want to read and others that I am waiting to purchase after reading those that I have. My pinterest name is bungirlpin. Add me please! I think I’m going to have to figure out some kind of virtual shelf because I read both e-books and the regular kind… Anybody know of a good app/website/etc to keep track of both? Still waiting for my invite… I really wanna play along! It is going to be a bit hard to beat this year though! I was motivated with #FinishYear and read or listened to almost 60 with the hopes of finishing the final two before the first. katmack on Pinterest- Ready to fill my shelf! LOVE this! I already have one book to add that I finished yesterday! My husband and I are going to do this. My pinterest name is Melinda Prince (Melindarprince) and my husband’s is K Michael Prince (karymprince). I’m amber_i_am on Pinterest. I’m going to use a Goodreads category as my “empty shelf” since I don’t have an empty shelf on any bookshelf in the house! John…do you arrange your books by color?? Also going with a goodreads shelf because I have no physical shelf space. I made a pinterest account just for this. My username is CoffeyCM1984. I have to find a clear spot on a shelve somewhere. Oy vey… I am the worst about actually reading, despite knowing what good things come from it. I have picked up much more since the start experiment though, and this sounds like a fun challenge! I’m in! MY pinterest name is revchristi. Please add me so I can post my first book! Please add me to the pinterest board. Sunni St. Pierre. I am already following your board. Live this idea. Please add me! I’m new to GoodReads and Pinterest, but I’ve been looking for a way to track my list of books to read so I’m giving this a try. My pinterest username is beerendsa. Oh my. There are 66 books on my ‘to read’ shelf already. I want to play! Username is tabyost. Thanks! I’m in, username is snixon! Ok, ok, I’ll go for it. 🙂 My pinterest name is Liz Alexander. Great Challenge! I’ve already started a list of books I want to read. Looking forward to seeing what others are reading too! Great idea! My Pinterest name is nrsratchett. Please add me. Shelf cleaned and ready to go. My Pinterest name is kacadea. Awesome idea. My Pinterest name is Pamela Hardman. Huntsvillechris is my Pinterest name. My Pinterest is emea. I’d love to be added! Please add me. My Pintrest name is Elizabeth Rose Mann. Oops! No it’s not, it’s elizabethrmann7. Sorry. Add me … !! My user name on Pinterest is kcoquinn01. I also use Goodreads.com to track all of my books on there (they have a yearly reading challenge) and I love that as well. My Pinterest name is lanettesc..
My Pinterest username is msgreen27. I love this challenge idea. My pintrest name is crisbliss ! I’m excited for this challenge! Add me! I do all three. Buy, library and digital. Any sugestions? Pinterest user name is ealeppek. Thanks! I’m in! I’m mizmynatt on Pinterest! I’d love to do this and I love Pinterest! My user name is LeslieZander. My 13 year old is a voracious reader so I will share her books as well. She will easily outread me! She does not have Pinterest. Thank you can’t wait to see the great books everyone reads. Please add me too! My pintrest name is ldsipes. Thanks! I’m really excited about starting this! I would love to be added to the Pinterest board. My username is karawilliamson. Thanks! Oh, this is such a delightful idea! Please add Tania1334! Please add me too. Sounds like fun! bhope32 is my username. My name is HuskMelissa and I’d love to be a part of this group. I’m in. Amyepatton72 on Pinterest. I think I’m going to need a lot more than one shelf! lol I do need to clean out my bookcase though, and I probably need to be more purposeful in what I read anyway. Not to mention, how cool to keep track of everything you read in a year! I’m in! My pinterest name is martimusprime. Jasturner is my Pinterest name. Well, seeing I refuse to get a Pinterest account (because I am too busy reading, writing, dreaming, and creating), I will not be participating in this as a “group project.” I already started something like this in July by listing all the books I read. Plus, I have never played well with others…I do not need others to challenged myself and to meet said challenge. But good idea for all the social media people out there. Making this a bulletin board in my classroom for the second semester. Students will pin thumbnails of book covers on to the board as they finish reading them. Empty Shelf Bulletin Board! Please add me too. My Pinterest name is jacqibarker. Thanks! I am in! I already cleared my shelf. My Pinterest name is Brittney Moore Creel. I LOVE this! I am challenging my students to participate as well. I’m in! Especially if I can put One Fish, Two Fish, Red Fish, Blue Fish on my shelf, along with every other book I’ll read my son. Might need two shelves…those cardboard books are awfully thick. Count me in! My Pinterest username is Ashaloolu. Love the idea, but I need to tweak it. I want to read the books I already own and EMPTY some shelves this year. I’ll collect them in one spot, (add my notes about kindle books) and donate them to charity next December. Can you add me to the challenge? My pinterest name is johnhouchens. I have SO many books we have shelves double booked…Can I use the top of my dresser? That’s where I was planning to keep my books I wanted to read this year. My Pinterest is meglettx. Im clearing a shelf today! I’m in two book clubs AND I read a ton for fun! What a great goal. erinmc316 is my pinterest name. Awesome idea! My Pinterest name is cullensmama. I just joined Pinterest for this, my name is Bailey Crawly. I have one board called the Empty Shelf Challenge, and my current display pic is of Homer Simpson. I would love to get in on this challenge, but I don’t have any free shelves, so I will take pics of all the books I read and at the end line them up and see what I have. I’m in! Pinterest name is carissaad. I’d like to do this to. My Pinterest name is n1elkyfan. I’m in! My Pinterest ID is txredraider96. I will never forget looking at Billy G’s shelves in utter amazement … bout to empty one! My pinterest name is atoth75! Add me in! LOVE this idea!! And I’m glad you added the part about digital books. I read most books on my Kindle. My Pinterest username is megandryann. Mommacrump on pinterest, I wanna try to do this! I’m in! My Pinterest name is Lisa Gill. Oops, my Pinterest name is actually lmgill. Great idea Jon! Thanks for including us all. Great idea! Now I need to go find a shelf. Add me please. Pinterest name is kaelamorgan. Thanks!! My pinterest username is bwhisp. I’m in! Pinterest name is JokerJim… I’m using GoodReads to track my reading which will be both paper and ebooks. This is a great idea. I’ve become a “collector” of books over the years which is sad because i used to love to read. This is a welcomed challenge! My Interest name is: CShelbyLPC (I think, Lol). This sounds like a challenge I can actually commit to. I just graduated from college after working towards this goal for nearly 20 years. I am so looking forward to reading for pleasure again. My fifteen year old daughter wants to get in on it too! Excited for us to do this together! My Pinterest username name is sgcwarren and hers is girlnamedgrace. Great idea! My Pinterest name is @savedbelle thx! Sounds good. My Pinterest name is Charrob58 (Charlene). My Pinterest is polm76. I would like to join the challenge! My pinterest name is Rebeka Vaughn. Already finished my first book so my shelf is no longer empty. I love this idea! I’m an English teacher — always looking for fun things to do with reading. Please add me to the Pinterest board; I’d love to participate! My username is jnlondon. I would love to be a part of this. My pinterest name is annajohnsonme. Could you add me to the Pinterest page? My Pinterest name is abbybrosche. Thank you! I’ll do what I can, Mr. Acuff. I’ll pack more books away so I can join the reading party. Hopefully books that you’re already reading count. I am Connielam1723 on Pinterest, I will probably do either a shelf on Goodreads or a new board on Pinterest. I am looking forward to this! Yesss!!! My Pinterest name is kardiacharas, please add me! My user name on Pinterest is seskue..I am a little confused about what I need to do to participate! I’m mostly an E-Reader, so I’ll probably just do my own Pinterest board rather than a shelf. If anyone has any good ideas about how I could do a shelf-like challenge, I’m open to ideas!! Mine is Roxaroos. Love this idea. If it’s not too late count me in! I was already planning on keeping a list of the books I read next year – an old and good habit I let die a few years ago. This might help. Please add me to the Empty Shelf Challenge. My Pinterest user name is Heather Thompson. I’m in! Another no bookshelf geek, but I will hit up the local flea market for one. Though I will likely add before that happens. Now – to find a shelf! Cool idea, but as a guy, I can’t bring myself to set up a Pinterest account. I’m afraid I’ll lose my man-card. Please add me. My Pinterest name is Caron Tindoll. Thanks! Wow I have no idea where that pic next to name came from. Anyone have tips on how I can add a photo to Pinterest? I’m in. Pinterest name is Amber Leach. How do I make a new shelf in Goodreads? Yes, yes, yes to this idea! My Pinterest name is Glitzngrits. I’ll have to take a pic and upload it. I just finished a “spring cleaning” why wait till the spring and bring all that clutter into the new year?!?! I have a stack of books waiting to be read and an empty shelf waiting to be filled. Love this challenge..already started my first book! I also use goodreads to track my reading and will use a screen shot of that 🙂 or of my nook! An awesome idea! I have “intentions” of being a prolific reader, but need some structure. This plan provides it! My Pinterest name is lifewriter. I just finished “Start.” 🙂 I bought it for my dad for Christmas, so I had to finish it quickly before we celebrate this weekend. I love this idea. Thanks for sharing! Thank you for the motivation to play this game called life just a little better! Please add me to this challenge! My Pinterest name is eveapple, at least I think it is. I can never remember. Please add me! My username is Erinjoys. My Pinterest name is Anne Pelchar. This looks awesome! Thanks! I’m out of town and won’t be able to actually clear a shelf until after the new year, but look for Dava White on Pinterest. I disagree that waiting until January 1 is stupid and fake. It’s a ritual, and there is power in rituals. There’s something symbolic about starting fresh on the first day of a new year. That said, I’ll still take that dare. My Pinterest account is pinterest.com/kimtracyprince. I already finished two books since you posted this! I’m in! Pinterest name is TMSanders316. What a great idea! My Pinterest account is jakeschweich . Please add me to the Pinterest board. Please add me, love this idea! I’m in! My pinterst name is Arona Martin, I think. Fun! I’m MamaMin on Pinterest. Thanks for the challenge! My Pinterest username is blessing06. Please add me to the empty shelf challenge my Pintrest name is: suziketch. This is a great idea!!! I use my name, Ashlea Davis, on Pinterest. Shelf is READY! What a cool challenge! I love the idea of creating a physical space but as a digital reader, a Pin board is a great way to make it a little more tangible. Love this idea! My Pinterest name is ashleyfeather. Can you please add me to the group? Love this! I’m “A Picture’s Worth” on Pinterest. Already started reading, looking forward to see what others share! My Pinterest profile is gingerboyll. So looking forward to this! Please add me! My Pinterest name is creativeamy. Thanks! This is awesome! My Pinterest username is kaela_moore. My Pinterest name is hayleycrowell. Thanks! I would live to join the challenge! Megan Underwood on Pinterest! My Pinterest username is cgrlawson. Cleaned off my shelf today! I would love to join! Megan Underwood on Pinterest. My Pinterest name is angresh. My Pinterest name is Denisse Warshak. Thanks! Pinterest name is Colette Greene, the one with the yellow tulip for a profile pic. Thanks, I’d love to play along! My user name is EmbracingBeauty or else you could use MrsAshleyWalkup@gmail . com. Please add me to the Pinterest board. My name is pastorjosh11. Please add me. Thank you! Please add me! I’m starting with Chasing God by Angie Smith. Can’t wait. Actually started today with LOVE DOES!!! Add me, please. Pinterest name is Donna Eisenbath. I’m just about to follow you, Sue Anne. It will be Diane Muir or pinterest.com/nammynools! Thank you! I look forward to this! What a great idea, Jon! This is so great!! My Pinterest name is Holly Sanders Tillery. Thanks! And my username is hltillery. Sorry! Please add me on Pinterest. I am youknowmeAl. ksgirl81 – please add me to the Pinterest board, thanks! You can add me, rsskng. Already started. Not sure if you will see all of these, but if you get to my name I would love to be on the board! This is a great idea!!! I feel nerdy but I am not sure if my screen name is other then my actual name, which is Christy Parker. My Pinterest username is Norman. Thanks! I mean norcman. Auto correct, I loathe you. I love the challenge…I’m in. My Pinterest name is Christina Lint. Please add me to your Pinterest board! My user name is creativemel. Thanks! My username is KyleMacon. So excited about this challenge! My pinterest name is cfrey77. I think this is an awesome idea. My Pinterest name is Susan Stone. May I join the challenge? Kimberly Merrell-Pelletier My husband and I both are going to do this. We might even encourage our 3 children. We might have to resort to baskets or spaces… all of our shelves are taken. It’s not finding your Pinterest account under the one you listed. If you follow me (http://www.pinterest.com/sue_anne), I can follow you and add you. Please add me my pinterest name is hoopjunky. Love this idea! Please add me. My user name on Pinterest is yrfavoritehswf . Thx and happy reading to one and all! Hi! My pinterest name is Samantha Moran. Excited about this challenge! I’ll actually be able to track my reading 🙂 please add me- @heatherhilbert on Pinterest! Excited to fill up my shelf! Please add me to the Empty Shelf Challenge List! My pinterest name is maryanngee. I tried to follow you, but it didn’t recognize your user name. If you follow me at http://www.pinterest.com/sue_anne/, I can add you. My Pinterest name is jeremystuard. My pinterest name is sarahcatesmiles!!! Started reading “Start” how appropriate. Hey Jon! My Pinterest tag is Byramstudio. It’s not recognizing your pinterest name. I’ve got my shelf ready and I’m debating whether my “how to” book should be the first one on the shelf. (I’m almost finished reading it). Please follow me on Pinterest (Sue_Anne), and I can follow you and then add you to the board. Love this! I’ve just started (today) tracking my books on GoodReads for this purpose, but I’d love to be on the Pinterest board too. My username is jenochej! my pinterest name is trleonard4 Thanks. My Pinterest handle is sonkist1. Thanks!! I’m at http://www.pinterest.com/reveillemoname/ 🙂 Stoked for this! I’m on Pinterest as dorisnash. I followed the Empty Shelf board–is there anything else I need to do? I love reading, so I’m in! (Laura N on pinterest). Just joined Pinterest. Either Craig Harmann or Harmannymusic. My pinterest name is rachael_lou (Rachael Davison) – so excited for this challenge! Count me in…Pinterest name is lezlieellis67. caseyzager is my Pinterest. Thanks! Pinterest name is shannonvrnr. Thanks :)! My Pinterest name is tonibethscott. My bookshelf is cleared and ready to be filled! My Pinterest username is commowife08. Please add me! My Pinterest name is pwy. Trying to figure out where I can make an empty shelf . . . I don’t have a empty shelf, so I found a corner in my bedroom that’s clear to put books. Really excited for this challenge. crothenberg on Pinterest. Please add me to this challenge. My pinterest name is Emity. Great idea. Pinterest name is kariebro. My pinterest account: http://www.pinterest.com/oddlysaid/ I think I got skipped earlier in the thread. Thanks! Sorry, ignore this. I need to learn to read the directions. Would love to join this challenge!! My Pinterest name is goldeylocks. This sounds like fun; please add me. What’s your Pinterest user name? it didn’t find you under SpencerPittman. If you follow me (Sue_Anne), I can follow you back and add you to the board. Most of the books I read are from the library so I’ll just pin my books. Pinterest name is Michael Kenan, Very original I know. I’d love to be a part of this! This sounds interesting. On Pinterest I am mwtsoftware. Please add me to the board, it’s the only reason I’m keeping the shelf. My pinterest name is tinkerbell9902.This challenge is going to be fun. I’m already following the Empty Shelf board. I’ll follow you back and add you to the board. My Pinterest name is shawnlindstrom1. Looking forward to this challenge. Great idea!! I may have to buy a new bookshelf! Pinterest name is Lisa Kunelius. Wonderful idea. My pintrest name is jjohnson26. I love this! My pinterest is @smuddles. I’m going to do a digital goodreads board. My pinterest name is ltmom. Awesome challenge! Love it! Thanks! Can’t wait! Halfway through Book No. 1 now. I’ll be reading all year long in all kinds of formats, so Good Reads and Pinterest will document the journey! I think it’s cute that you color code your bookshelves! In a completely masculine, macho, manly way, of course! Oh John, I applaud you for getting folks excited about reading and challenged to read! I won’t be taking part in that challenge because I fill up one of those shelves (figuratively) about every other week and I read almost everything from the library. I will really look forward to hearing how folks are progressing! Love it! Great idea! My Pinterest username is rorygir1. Please add me. My username is auntieb7. Thank you. Love it! My Pinterest name is heatherlow. Just finished my first book tonight!! I’m in! My Pinterest name is pjrhodes. Sheld cleared and photo posted. What is your user name on Pinterest? If you follow me (@Sue_Anne), I can follow you back and add you to the board. This is fantastic! My username is muziqfreak1. Can’t wait to see everyone’s progress! Looking forward to it, Jon, thanks! I’m in on this challenge! Great idea an thanks for sharing it. Please add me. I am bminish on Pinterest. Thanks! I am in! Pinterest name, BryanARiggs. Please add me to the board. I can’t wait to get started. Maybe I will finish more books this year. Maybe I should learn to spell my name first. So excited I have fumble fingers. What’s your Pinterest handle? If you follow me (Sue_Anne), I will follow you back and add you to the board. Please add me to the pintrest board. My Pinterest name is abcbuckeye. Thanks! My pinterest user name is cricketsdeligt. I finished my first book last night – Spring Fever! Great idea!! My Pinterest name is melodious201. What is your pinterest handle? If you follow me (Sue_Anne), I can get you added. dlcarlton actually is my pinterest name, wasn’t thinking!! Oh, and in tribute to Jon, my Pinterest picture is a picture of Tom Brady crying. I would really like to do this and left a message earlier and on facebook but I am not able to pin to the page …. I’d like to join in! My pinterest name is tarynliz. Please add me Jennjwoodward thanks! I’d like to participate. My Pinterest name is stephanicochran. Thanks! I hope I’m not too late to sign up! I’ve already read my first book… My pinterest username is Brittany Gulbrandson. Please add me to the board! lklmail (that’s LKLMAIL). Looking forward to it! My pinterest name is marybush81. My pintrest is jnmariott. Thanks!!! My Pinterest name is heatherk73 can’t wait to start! This is an excellent idea. My username is kylebueermann. What is your Pinterest name? If you follow me (Sue_Anne), I can add you. I just added you. Could you add me to the board? Thanks! Please add me! My pinterest account is nofruitinmytea (http://www.pinterest.com/nofruitinmytea/). Thanks! I am super excited about this! My pinterest name is medwards22! Thanks!! I love this!!! But I can’t really leave an empty shelf because it is already filled with way too many books to read. My challenge is to finish reading those books before I buy some more. Great challenge though! Love this challenge! Just cleared off my shelf today. I just followed Sue_Anne. My Pinterest name is andreaborsvold. Add me please! Please add me… Pinterest at fnance. Whew! Finally got my shelf cleared & I’m ready to go. My pinterest name is dballard94. I’m reading a novella that isn’t bound in the same way your average book is… in fact, it’s released to us four pages at a time over the course of 72 weeks (we’re FORCED to pace ourselves!) …anywho, It dawned on me that as of this week, I’m actually finished with it. 72 weeks…. and it’s not even the longest time I’ve spent on a book! Pinterest name is jrstivers thanks! This is a great idea! brandonweldy is my username. I’m so excited about this! My Pinterest is emilykazakh. I would love to be added to the empty shelf challenge! My name on Pinterest is Sarah Bannister. There are quite a few, so it might be easier to search for ‘starbursts299’. Thanks! LOVE this idea. Will be blogging about it quite soon 🙂 Can’t wait to get reading! OK, I’m down. Isn’t is just as much fun to see what other people are reading as it is to show off what you are? My pinterest name is amcnabb27. Can’t wait to start! My pinterest username is heatherahughes! I’m on Pinterest….and would love to join your board on this challenge. Please add me to your board. Thanks! This looks like fun. I’m shermaclarke on Pinterest. Just posted my empty shelf! You can find me at Sara Keleher on Pinterest! Whoa. Holy viral post, Batman! My Pinterest name is secretham. I’m in! My Pinterest name is: ajwaggoner. My pinterest name is sforthman. Great idea! My Pinterest name is sarahryoung87. great idea! my pinterest name is amymatkovich. LOVE this idea! Not only am I going to do it, but I’m challenging my personal children and classroom children as well! My Pinterest username is shulsman. Thanks so much! Please add melpetro on Pinterest. Thanks! Note to self: Get book shelf. Totally excited to do this! Please add me to the Pinterest board. My user name is biffyj (or Biffy Jesse). Thanks! http://www.pinterest.com/1girlriot/ –I’ll add my bookshelf shortly. Sounds like a good plan. My pinterest name is lizhelland – thank you! Oops! My pinterest name is actually thelizhelland – Thanks! awesome! My Pinterest account is emilybedwell! JC’sPins starting empty but I have my list! Oh account name is jcspins no punctuation. I’m always up for a challenge! Challenge accepted. My Pinterest name is marshalgraham. Followed you, my pinterest is jboykin72. Now off to clear a bookshelf!! Just finished my first book for the challenge. So exciting! My Pinterest name is Cambryn Willsey. Thanks! I’m excited!! My Pinterest name is charitylcraig. Please add me! Pinterest name is bklovr. (no e.) Thanks!! My Pinterest ID is cylo3. Excited to see how many I can read and any ideas from posts by others! Please add me for the empty shelf challenge. My Pintrest user name is grohlgirly. I’m hoping this challenge will help me CLEAN OFF my shelves – so many books, so little time! I have an embarrassing number of books in my house that I haven’t read. My goal is to clean off at least one of those shelves this year. Thanks for the challenge! My pinterest name is jbrooxd. Please add me, Jon. My username is designerstacie. Thanks and Happy New Year! Is it too late to be added? I was contemplating before making a final decision! I plan on reading anyways and this is a great way to be held accountable and SEE progress. Watching the board has been inspiring and motivating. Thanks Jon! You’ve also inspired me to open a community board for a project I’m working on this year to simplify. So thank you for that inspiration as well. Sounds like fun! Count me in! My Pinterest name is Diana Wille, and my user name is pasadenagal61. Please add me to your Pinterest board. This is a great idea/challenge. In 2012 I read over 30 books because I set a goal of 3 books each month. This last year I didn’t set a goal for my reading and only read a handful of books. I’m looking forward to getting back into the habit of reading with this challenge. My Pinterest name is tjfruichantie. I’d like to join the Pinterest Board. My UN is katevaliente. I’m in. I’m not on Pinterest but I did create an online empty shelf on my blog. Looking forward to more reading this year! Thanks for the challenge. Is it too late to get in on this? My Pinterest is TanyaDennis. Do you organize your books by color? I know my Pinterest username wasn’t enough to find me for my first request. I am hoping to still be able to join the Empty Shelf Challenge! My Pinterest name is mvaillancourt Thanks! Challenge accepted! My interest name is rudy227. I love this idea, please add me, ThatsReesie on Pinterest. Thanks! I love this idea! It’ll hopefully help me to start AND finish books. I’m on Pinterest at ilovebaseball. Please add me to the board. My Pinterest username is @anneliz. Please add me to the empty shelf challenge. My user name on Pinterest is Agnes Tirrito. add me to the board! bmwaters! I can’t wait! Can you add me? My Pinterest name is crysdale. Please add me! My Pinterest user name is scrutchfield. Thanks! I’d like to be added on the pintrest board. My Pinterest name is TheBalancedWife. I’d love to be added to the board! Finally got a shelf cleaned off so I can start! And here’s the link to the board I made for it! If that’s easier! Can someone add me to the shared board? My user name is shayprendy. Thank you! My Pinterest username is hchollar. I’d like to be added to the board. I’ve cleared my shelf! My Pinterest user name is Angmarieaz . Can’t wait to start! So excited for the challenge! Please add me – http://www.pinterest.com/trulyblessed11/ and I just followed you, Sue Anne. My pinterest name is Brooke Batchelor, please add me! Love this idea! I was actually just commenting today that one thing I want to do for next year is read more books, so this is perfect. My pinterest name is sunnyb64. On Pinterest at saricaudill. I’m in a temporary housing situation and don’t have a bookshelf. A Pinterest board will do! Trying this again cause I think I got missed! Pinterest name is treesalyn. Heyyyy! My Pinterest username is: five_svnths. I’m super pumped about this. I haven’t read for fun since before college. Love this idea! Finally getting around to posting my Pinterest username. Very excited for this project! Please add me to the Pinterest board please! Excited about this challenge! I’ve followed the board, my Pinterest profile is http://www.pinterest.com/adwicknig/. I’d like in. Blwells45 is my username. I have two to post!! Please add me: adelahufford. Thank you! Love this! My wife and I will probably work together. My Pinterest name is phillip320. Sorry, I know I’m late to the game. I just got my shelf emptied last week, and I’m hoping to have two books done this week. Can I still get added to the board? My user name is phillip320. Just setup my empty shelf and ready to go. Pinterest name is Scott McFaddin (scottmcfaddin). Can’t wait to fill her up! My Pinterest name is frontrowjess. I started an Empty Shelf board already. Excited about this idea! my pinterest username is JoeFarageJr. Please add me to the group! I’ve already read two books! My Pinterest name is nbcopeland. I started an #EmptyShelf board. I never got added to the board either(matman42). I’m in…just cleared off a shelf! Now to get reading as I have books piled on the floor! Pinterest name is AntShanny. Cool! I’m in!! Coffeered on Pinterest . Add me please. Ward Hughey is the name on pinterest. I just made an account solely for the purpose of the challenge! Please add me to the board. My name is Betsy Pond and my Pinterest user name is bpondo. I just followed you Sue Anne 🙂 Thanks! Happy New Year! Please add me. I’m Melinda Lancaster on Pinterest. Please add me! My Pinterest name is Milaka Falk. charlottedean29 is my pinterest name. Please add me (Rebecca Budzinski) to the Pinterest board. Thank you so very, very much… Happy New Year! My husband and I are taking on this challenge; my Pinterest name is andreaw365. Looking forward to the fun. Janice Stephens is my Pinterest name. Please add. I just followed the Empty Shelf board on Pinterest. Can I be added? My Pinterest name is bernrome. Thank you! Please add Pinterest user flomostayc to your a Empty Shelf Challenge board. Thanks! Please add me! Pinterest name is Marcie Bullock. Thank you! I’m Jennifer White on Pinterest and I JUST ordered new bookshelves 2 days ago! my Pinterest name is henrca05, please add me to the board! I would love to join in! My Pinterest username is IAmScrappinArt Thanks! My Pinterest name is MadameDobe or Stacy Dobernecker. thanks for this challenge – I’m encouraging my whole family to participate. Seriously. Am I ever getting added to the board? I keep checking to no avail. Stellar idea, Jon! My Pinterest name is unebranche, and I’d love to get involved! What do people who read a lot of library books do? Please add Vicki Herring Watson to your board! @brendaabell on pintetest. Love this challenge and fingers crossed I stick with it!! Sue Ann I started following you.